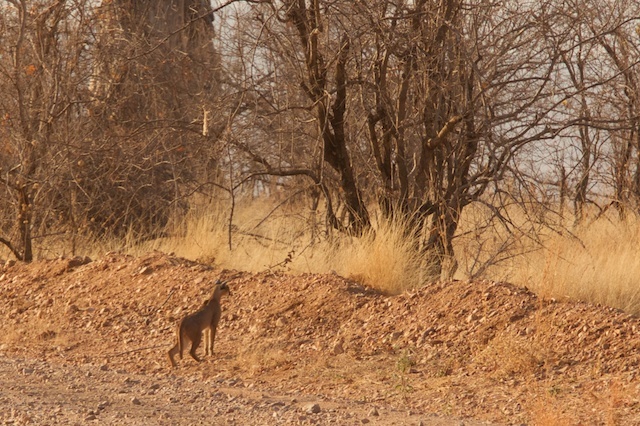 The Land-cruiser stopped so that we could watch a group of chattering banded mongooses rushing across the track. Every now and then one would stand on his hind legs and look around in case there was danger. 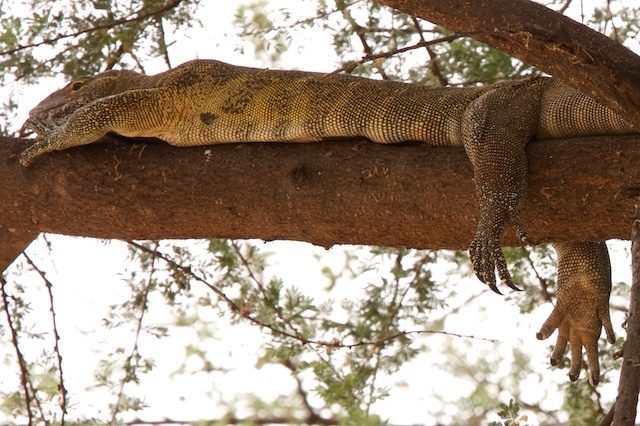 While there one of us noticed a water monitor lizard lounging over an acacia branch above us. He seemed to have an ideal spot to enjoy a cool breeze, and we wouldn’t have noticed him if we hadn’t been parked underneath him. 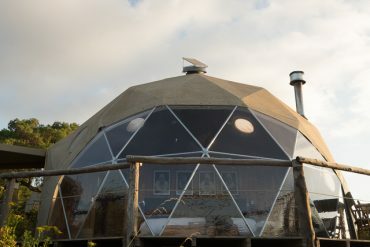 Then something flashed past the front of the Land-Cruiser, and a second later we heard the squealing of a distraught mongoose. It was a serval cat, with the mongoose tightly held in its jaws. 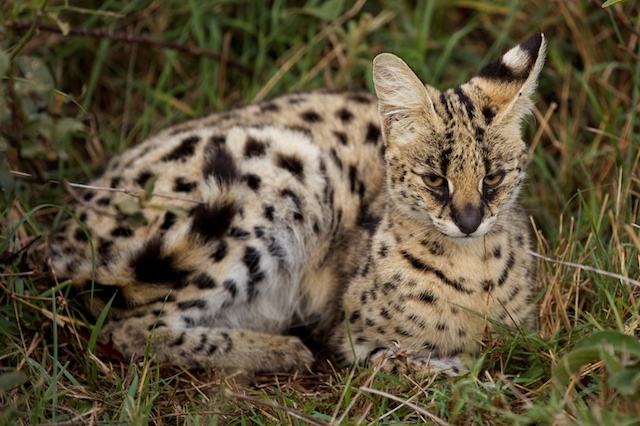 Serval cats are beautiful spotted cats that are often found in grassland habitats and have large ears. 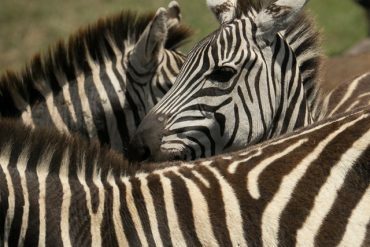 They are extremely adept at hearing a mouse or other prey rustle in the grass, and often leap into the air, hitting their prey from above. I see servals fairly often in the Serengeti, as well as the African wildcat, which is the other small cat one is likely to see. The wildcat was domesticated by the Ancient Egyptians, and over time diverged into the tamer domestic house cat. 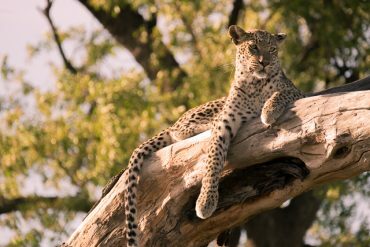 Human populations have increased so much, and the domestic cat has increased in parallel, that wildcats (Eurasian and African) are threatened with being crossbred to extinction by feral domestic cats. Anyway it was wonderful to see a serval here in Ruaha National Park. 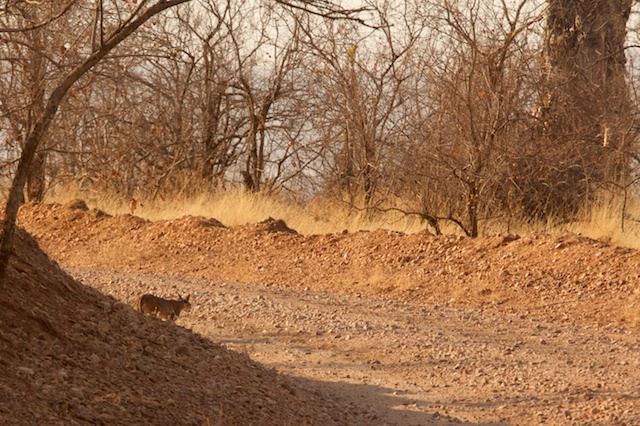 The following day we were driving through hilly combretum covered country when another small cat appeared on the side of the road. 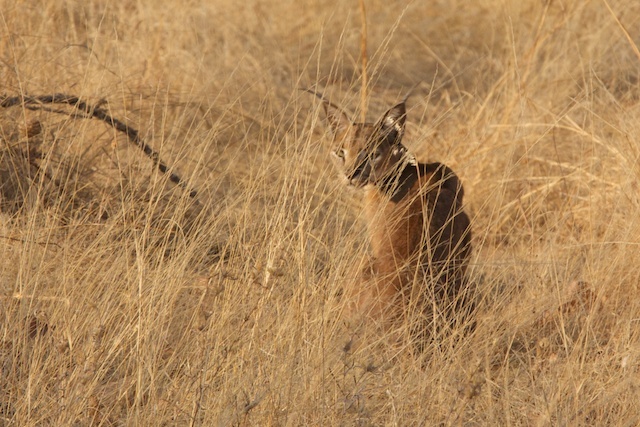 I was thrilled to see that it was a caracal. 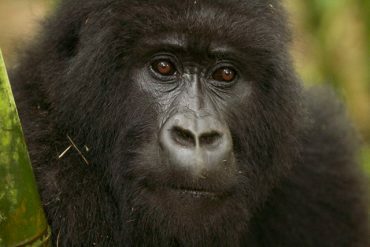 These amazingly powerful cats are rarely seen, as they are very shy. They are sometimes incorrectly referred to as the African lynx because of the long tufts of hair on the tips of their ears, and the short tail. However these traits must have evolved because they fit a similar ecological niche to the European and the Canadian lynx or the bobcat, but the caracal is not a lynx. Although most caracals weigh from 8-16 kg (15-35lb), they have been recorded as big as 20kg (44lb), which is up to about half the weight of an adult cheetah. 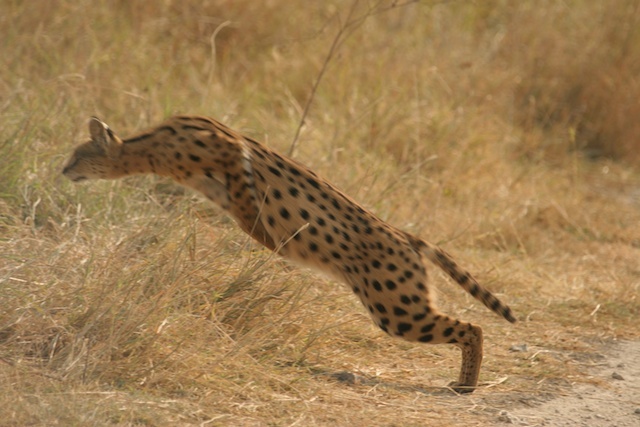 Servals may be a similar weight to the average caracal, but only have been recorded up to about 12 kg (26lb). Caracals are a beautiful fawn or rust colour, with black markings on their face, and a lighter underbelly. 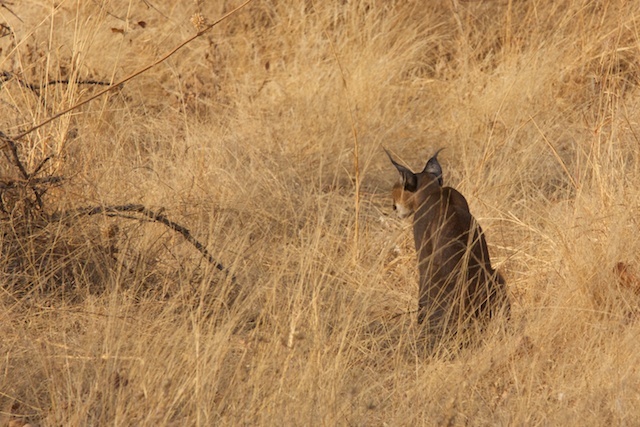 I have only occasionally seen a caracal in years of guiding, as they are so elusive, so this was a good sighting. Surprisingly of the three mentioned smaller cats, the caracal is actually the least endangered, and is very widespread, being found in Asia too. 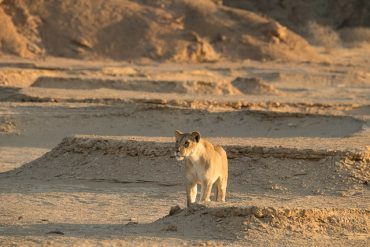 They are excellent stalkers, and catch mammals the size of hyrax and even birds. 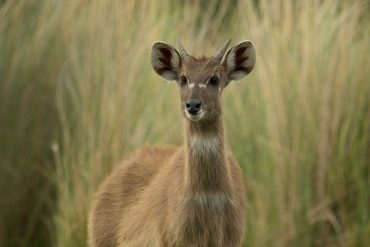 Occasionally they catch small antelope such as steenbok. The cat walked towards us down the road, and then heard something move in the long grass, and after a pause, disappeared into it. We waited a while hoping for it to reappear. Suddenly we saw a white-bellied bustard rocket into the air, and a split second later the caracal leapt almost 2m (6ft) vertically and swiped the bird to the ground! It was an Olympian leap. I had often heard of the caracal’s ability to do this, and now I had seen it! We never saw the caracal again, but I am still reeling over that feat.